Do you ever need to charge your laptop or camera battery during travelling? A Rogerverter is an electronic device that takes a DC inputand converts it into an AC output. Since car batteries provide DC voltage, and most consumer electronic products are working on AC power, Rogerverter is useful for using laptops and other devices on the go. A ROGERVERTER is acar inverter that takes a DC input and converts it into an AC output. Since car batteries provide DC voltage, and most consumer electronic products are working on AC power, ROGERVERTER is useful for using laptops and other devices on the go. Easy Convertor: While using it with car’s cigarette lighter, it provides 12V to 220V (till 150 W) power. Thus, you can use or charge any electronic products like laptop, mobile, camera or any other products which requires 150W power. Fuse Protection: Due to fuse protection, even if sometimes battery’svoltage goes up, it will not damage your device. Only fuse of invertor will blow. ROGERVERTER increases life of the device and it keeps car’s wiring safe. Trip in Overload: When ROGERVERTER car inverter receives voltage higher than 15v-16v or lowers than 9v-10v, it automatically trips and will stop working. Thus, it increases device’s safety. USB Output:ROGERVERTER car inverter provides a USB port so any device charged through USB can be used or charged easily. Warranty:ROGERVERTER car inverter comes with 18 months Warranty. 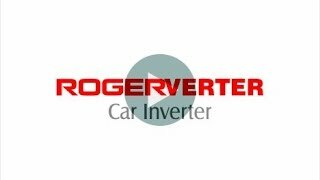 ROGERVERTER car inverter is created for a very purpose of using electronic devices on go. It is designed to convert a car’s 12-volt DC power to 220-volt AC, allowing an electronic device to be plugged in andoperated just as if it were being used in the house. Due to USB interface gives liberty to charge any devices required USB port.It is compatible with most appliances and devices.It is very easy to use ROGERVERTER car inverter. As you just need to plug it into a cigarette lighter socket and it starts working. You can then plug your laptop or can charge your mobile phone with USB port.Since most carmakers have not treated this critical need in cars yet, the ROGERVERTER car inverter bridges the gap. Now, any car user can easily purchase ROGERVERTER online through the Roger Techssories website and from Roger’s retail outlet. Thus,don’t wait to purchase this super cool product. It is worth using and value for money.